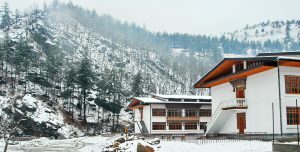 Pelkhil School is a private institution located in Tashi Pelkhil Village along the banks of Thimchhu in Thimphu Valley. It was established in 2010 in the Year of the Iron Tiger and the school mascot is the tiger. The 8 acre campus is just minutes from the centre of the capital city yet it enjoys the quiet of a rural setting. The School recognizes the importance of academic achievement but also emphasizes active participation in all sports and extra-curricular activities for all students. The School also recognizes the challenges families face especially in the context of Bhutan’s rapid and continuing transformation. The School therefore aspires to do all it can for its students including drawing in greater and more positive involvement of their parents. The School also aspires to cultivate and retain an outstanding and committed faculty and provide programs that keep students engaged and also inspired. A good faculty is a good school’s greatest asset. Pelkhil is a co-educational, non-residential school for students from pre-primary (age 5) to grade 12 (age 17 approximately). We have received permission to introduce residential facilities and we will do so once our plans are ready. Our student body consists of children of middle-class businessmen, civil servants and ordinary citizens. We have many students on academic and sports scholarship. In 2016, the Ministry of Education gave Pelkhil School the ‘most improved’ award for academics in both the grade X BCSE and grade XII BHSEC examinations. In sports, the School has been dominating the scene in most major sports. In 2016 the School teams completely swept all the trophies in the inter-school sports carnival. Students at Pelkhil prepare for the BCSE and BHSEC examinations for grades X and XII conducted by Bhutan Council for School Examinations and Assessment. We have also received approval to introduce Cambridge International Examinations (CIE) at Pelkhil and we have begun to prepare to for affiliation. In the Primary Wing, we have already introduced the Cambridge Primary syllabus with supplementary Cambridge text and curriculum.